Radical collectors and dealers do write some extraordinary things. For some reason they want to belittle the importance of archaeological contexts. "Context is important, but to some people, objects have a meaning that transcends context: their humanity, their expression, something that we admire and that puts us in awe of the artist. And that's what we feel is important. These objects continue to live for that reason, and play a part in our spiritual lives." It seems to be the artistic achievement which is so important - even though it is the work of an anonymous crafts(wo)man. The archaeological context appears to be unimportant even though it would tell us about the ancient viewer of these objects. Ward reflects on his 1993 "show" of "Mycenaean gold" which he admits was "a disaster". He claims that the Greek government "had concocted a provenance for the pieces so they could be claimed as cultural patrimony". Indeed, "the fanatical political agenda was more important than the truth". So what is the truth? That a stunning hoard of Late Bronze Age jewellery appeared on the New York antiquities market without a recorded find-spot? Ward belittles the objects: "the news media called the gold national treasures, and made that appear much more important than what the pieces could tell us about ancient Greece". Ward in his interview never mentioned the topographical name of the site. 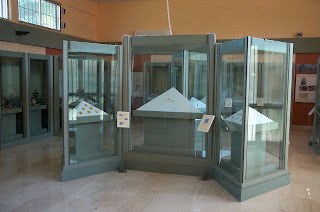 However, the Greek government took legal action because archaeologists believed that the gold items "were the product of illegal excavations at the Mycenaean cemetery of Aidonia near Nemea" (in the Peloponnese). Parallels with excavated material suggested to the Greek authorities that "the New York assemblage must have come from the chamber tombs of the rich cemetery at Aidonia, which rivals the other late Mycenaean cemeteries of the Argolid in significance and is the most important Mycenaean cemetery to have been extensively looted in the past twenty years". Does the gold come from the cemetery at Aidonia? Can we be certain? Certainly the "New York" objects share characteristics with the excavated material. But does that mean that they were buried in the same series of tombs? "illegal excavations and antiquities theft ... result not only in the illegal export of antiquities, but also in the destruction of the evidence which is indispensable for scholarly research" [emphasis mine]. Archaeological context matters. And we would understand the richness of Late Bronze Age Aegean society so much better if these tomb-groups had remained intact to be excavated, studied and published by archaeologists. Demakopoulou, K. Editor. 1996. The Aidonia Treasure: Seals and Jewellery of the Aegean Late Bronze Age. Athens: Ministry of Culture Archaeological Receipts Fund.